Suniel Mande is the head of Global Alliances and Partnerships at Indus Software Technologies. Founded in 1989 Indus is an enterprise software product development and services company with a focus on the Banking & Financial Services, Insurance, Telecom and Utilities industries. In our conversation Today Suniel takes us along the journey Indus Software Technologies went through in developing alliances and partnerships around the world. 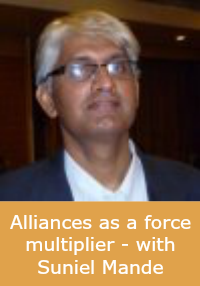 Suniel explains why alliances and partnerships are a force multiplier for companies that want to grow. He shares some lessons learned along the journey as well as the dynamics of maintaining a partner program and why it is important to keep it healthy. I greatly appreciate your effort to leave a review. These reviews on iTunes help spread the message and help make more people aware of the power of collaboration! Thank you in advance for leaving one!